Dish TV – India’s Biggest Television network spreading all over in India from rural areas to urban ones. With great picture quality, incredibly vivid colors, sharper images and stunning surround sound, Dish TV HD takes TV viewing to a whole new level. 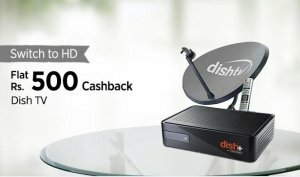 Now Buy Dish TV via Paytm & Get Flat Rs.500 Cashback on Dish TV HD & SD Combos. Promo Code MOB500 Use promocode MOB500 to get flat Rs.500 cashback* on total order value. COD option will not be available on applying this promocode. That’s it! A TataSky Executive will either call you or Visit your place within a week to setup your TataSky Connection for free! Delivery timing – Expect the product to reach you within 8-11 days of order. A) FREE Summer ticket A-la-Carte pack: This summer, delight your kids with a special pack from DishTV that gives access to Kids Box Office, Games Active and Playin TV. Entrall your kids with programs that showcase Stories, Movies, Rhymes, Games and engagement activities, to keep them entertained all summer. B) FREE Dish Box Office 2 A-la-Carte pack: With this special pack, enjoy blockbuster Bollywood movies throughout the day!